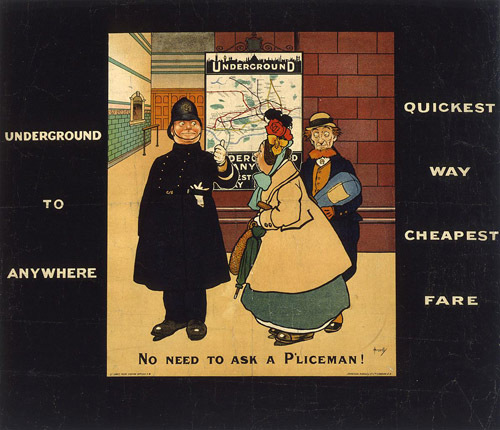 This week’s Poster of the Week is the classic ‘No need to ask a p’liceman’, the first pictorial poster commissioned to promote the Underground. 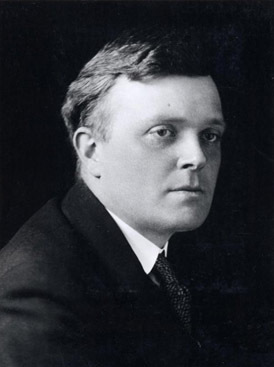 The ingenious commissioner was Frank Pick, a young solicitor who came to the Underground Group in 1906. Pick was made Traffic Officer in 1908, at a time when the company was facing bankruptcy if passenger traffic did not increase. The electric lifts and fast, deep level trains of the new Underground lines proved a daunting prospect for some Londoners. Pick saw the potential of modern pictorial posters to drive up passenger numbers by changing the way people felt about the Underground railways – by showing the Underground as the heart of London. To fulfil this brief, Pick commissioned John Hassall, one of the leading poster artists working in Britain at the time. Hassall had already produced posters for the mainline railways and other companies and his use of bold colours and humorous characters would have been popular and recognizable for Londoners. The poster shows the brand new Underground map at its centre. This map was the first time that the Underground Group railways had advertised themselves together under the new ‘UndergrounD’ legend and it presents an integrated and easily navigable system. The title of the poster adapts a popular music hall ballad of the time, ‘Ask a p’liceman’, and the slogan ‘Underground to anywhere, quickest route, cheapest fare’, was supplied by a 14 year old boy following a competition in the ‘Evening News’. The new map replaces the policeman as ‘way-finder’ as he shows the two country folk the new way to navigate London. The two ‘country bumpkins’ are shown as out of touch and unfashionable, highlighting that modern and sophisticated Londoners could confidently navigate the modern Underground. Frank Pick’s first commission paved the way for one of the most ambitious and long-standing poster advertising campaigns of the 20th Century, but Pick’s influence on London goes far beyond poster commissioning. To find out how Pick’s work still influences the way we live today, come to our talk, ‘Frank Pick’s London’ on Monday 4th November, where Oliver Green will be introducing his new book Frank Pick’s London: art, design and the modern city, published by the Victoria & Albert Museum in association with London Transport Museum. and from 1908 the underground group, under Pick’s direction, used images of country scenes, shopping and major events on posters to encourage use of the tube.